Many workers face occupational burn hazards – perhaps none more so than firefighters. 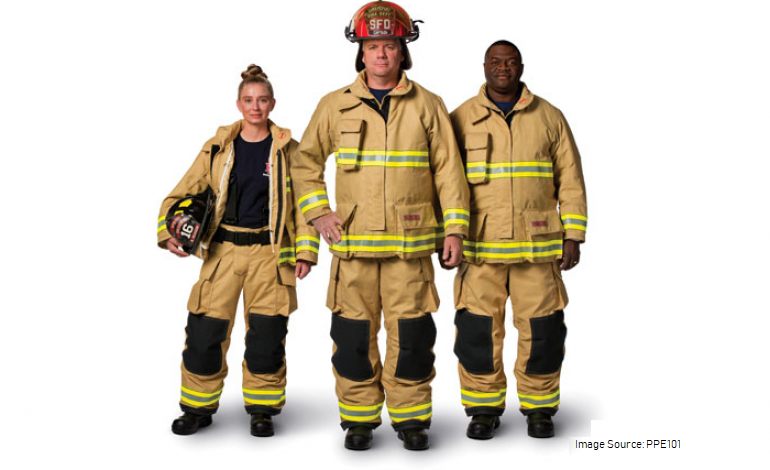 Firefighters’ protective equipment (PPE) is intended to protect them from burns due to thermal radiation and other thermal hazards, using simulated skin in empirical tests. But PPE are complicated systems – and skin is even more complex. How well do test results from simulated skin transfer to a real-world situation, and how can you convert a test with simulated skin to a real-world burn hazard metric? Work from Polish heat engineers published in the International Journal of Heat and Mass Transfer sought to explore that question, and to develop a method to predict how test results using simulated skin will translate to a real-world scenario, which has application to all forms of thermal PPE design. The skin-PPE system consists of several layers (Figure 1). The outermost layer is the outer shell of the PPE, which provides the initial protection against the heat sources. Under the outer shell, there is an air gap between the outer shell and the moisture barrier which keeps the inner insulation dry. There is a second air gap between the moisture barrier and the insulation material which ensures the underside of the PPE stays at a safe temperature. Between the insulation and the skin, there is a third air gap. Finally, the skin itself consists of three layers: The relatively thin, protective epidermis, made up of dead skin cells; the dermis, a thick layer of tissue under the epidermis, which contains capillaries, hair follicles, connective tissue, nerve endings, and other structures, and the subcutaneous tissue layer, made up of fat cells, lymph vessels, blood vessels and other structures – all of which can be damaged in the case of a severe burn, potentially resulting in live-long complications, such as scarring or disability, or even death if the burn isdeep enough or covers a large enough area. For firefighters to fight fires without undue risk to life and limb, PPE must be sufficiently insulative to keep the firefighters’ skin below a temperature that would result in a burn injury. Testing PPE cannot be done with live subjects due to ethical and safety considerations – so instead skin simulant materials are used. Heat damage to the skin simulant material, which is designed to mimic the thermal properties of human skin, indicates that the PPE is unable to protect human skin from a burn hazard under the conditions tested. 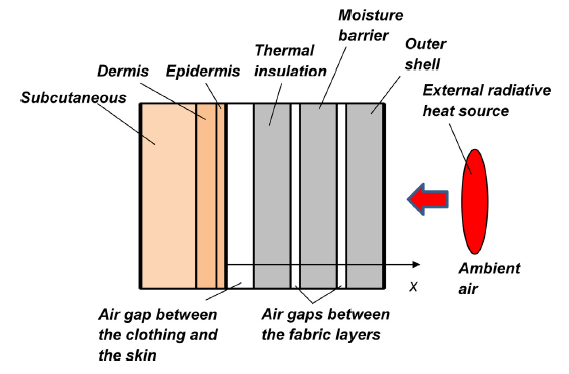 It is, however, not possible to perfectly mimic the complex relationship of thermal properties, mechanical properties, and circulatory systems in human skin – so any simulant material will perform differently from human skin, and this error could be dangerous if the skin simulant overestimates the protective capacity of the PPE. Thus, if thermal effusivity of clothing, skin simulant, and human skin are known, and the temperature-time behavior of the skin simulant is known, the temperature-time behavior of the human skin may be predicted. In this way, the performance of PPE with a skin-simulant material may be extrapolated to the performance with human skin. Figure 2. Performance of the simple approximation detailed in the equation above for three heat-transfer cases. The performance of this simple approximation is illustrated in the figure above. For short exposure times, the simple approximation works quite well to predict performance of the clothing – within 3% accuracy across the full range. 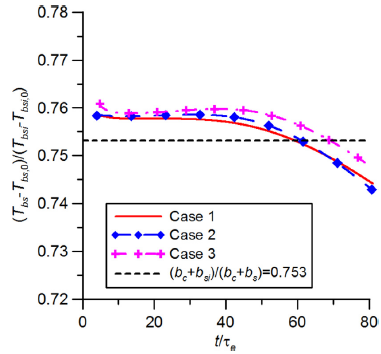 If greater precision, or longer exposure times need considerations, the authors also derived a more complicated relationship accounting for perfusion in the skin, which requires an inverse Laplace transform. Comment on "Using Thermal Effusivity to Predict Burn Hazard from the Result of Testing Using Human Skin Simulant"